DANIEL TAUBER is a long-time Israel activist, an oped columnist with the Jerusalem Post, and an attorney admitted to practice law in New York and Israel. Daniel led the revival of Likud Anglos, reinvigorating it with youthful energy, fresh ideas, and a cadre of young idealogical and ambitious olim. Daniel was elected to the Likud's Central Committee, ranking sixth out of 303 candidates in Jerusalem. 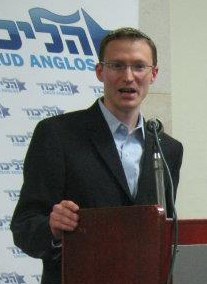 In January 2013, Daniel was a formal candidate for the Knesset with the Likud. Having made aliyah in November 2009, Daniel earned his bachelor's degree in Law & Philosophy from Brooklyn College, where he was president of the pro-Israel club, the Hillel/Jewish Student Union, and the student government, as well as an editor and writer for a variety of student newspapers, included one he founded called The New American Voice. Daniel also volunteered for the ZOA, helping to found the organization's national student magazine - The College Zionist. He also was an intern for AIPAC and served as the organization's Campus Liason to Brooklyn College. After college, Daniel founded "Committee L'ma'an Tzion" which opposed Ehud Olmert's convergence plan, distributed "orange" literature to various synagogues in New York, conducted online propaganda and held a rally outside the Israeli consulate in New York. Daniel earned his legal degree from Fordham University School of Law. During that time, Daniel began publishing articles in major publications such as The Jewish Press, Arutz Sheva, the American Thinker, and The Jerusalem Post. Daniel also studied key areas of Israeli constitutional law such as judicial review in Israel and the Law of Return. Daniel graduated law school in May 2009 and was admitted to practice law in the State of New York in March 2010. In November 2009, Daniel and his wife, Chanie, made aliyah and moved to Jerusalem. Daniel was admitted to practice law in Israel in December 2011. Shortly after making aliyah, Daniel signed up as a member of Likud and got involved with Likud Anglos, which had become inactive. Under Daniel's leadership the organization has been revived holding regular activities, lobbying Members of Knesset, and involving the English-speaking community in Israel's political process. Daniel, whose grandfather, Rabbi Jack Tauber, had served as personal secretary to Ze'ev Jabotinsky, believes in the Revisionist-Zionist philosophy of Jabotinsky and Menachem Begin.